Make your own Tiny World! Saturday, February 27, 10am to 4pm at my house. (Boston area) $60 includes everything but the teacup- you can bring your own. Limited to 8 people. More info. Email me at mimik@pobox.com to sign up or if you have questions. Hurray! The pattern is listed! An explanation of the name- which I asked for opinions about a few posts ago… I am of the school that feels that people like to pick their own name. But, the pattern needed some kind of label. My kids went to a wonderful nursery school where everyone called each other “friends”- instead of children, kids, boys and girls, hey you… They would say- will all the friends line up to go outside now. Like that. I always loved it. So, here is a friend! 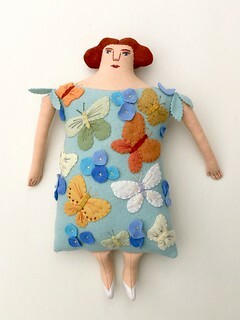 Make your own friend Kitty- an eco-friendly girl or boy doll made from a felted wool sweater. Clothing instructions included. 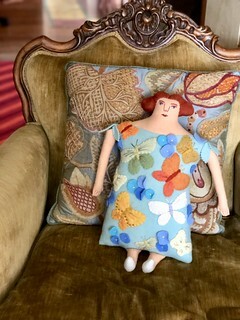 Finished doll is approximately 15″ tall (depends on the fabric used). This PDF pattern is 23 page and includes full size pattern pieces for the kitty, written instructions and step-by-step color photographs. It also includes notes on working with recycled clothing. This sewing project is suitable for an advanced beginner- It uses the sewing machine, some hand sewing and basic embroidery. The clothing instructions involve some simple math. 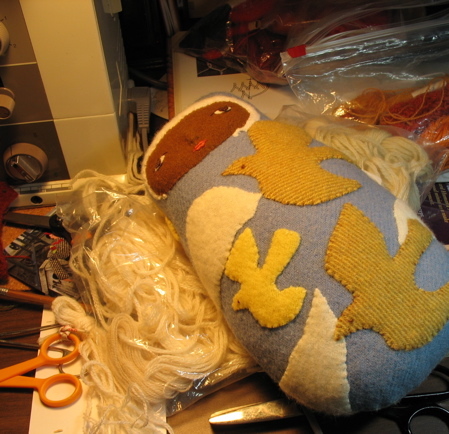 Supplies needed for this project include- a felted wool sweater, stuffing, embroidery floss and bits of felt, basic sewing supplies like needle and thread. Upon purchase, instructions for downloading the pattern will be emailed within 24 hours. 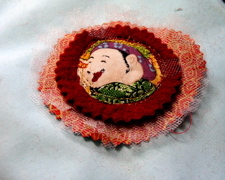 I will send it to your etsy email address unless I am instructed otherwise in the note to seller. This pattern is for home use only. This pattern is copyrighted and cannot be re-sold, reproduced or shared without permission. Thank so muchÂ to Marianne for making the first one! tiny world pattern- it’s now available! My testers finished it quickly- Thank you! The feedback was mulled over, tweaks were made and here it is! 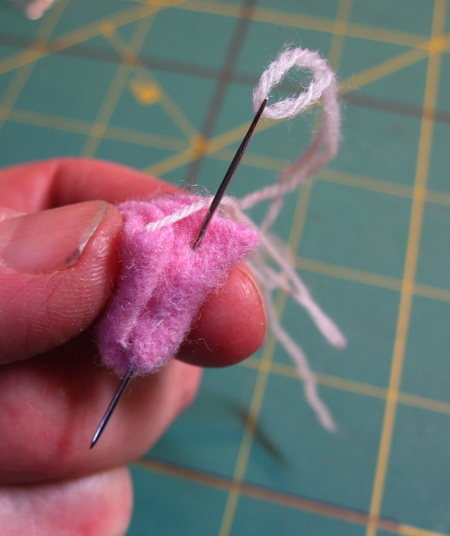 Make your own Tiny World Make-do Pincushion! This PDF pattern is 21 page and includes pattern templates, written instructions and over 40 step-by-step photographs. 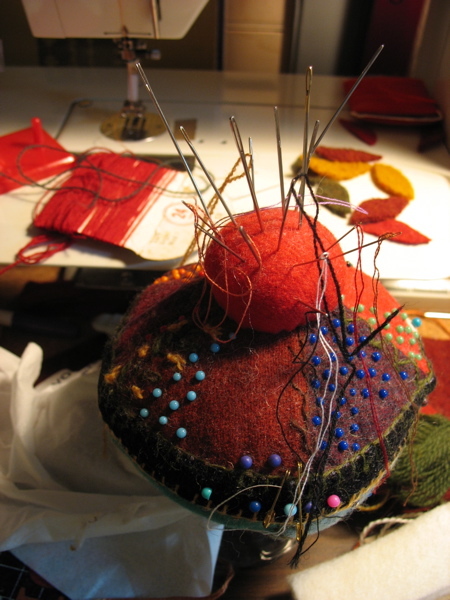 Supplies needed for this project include- a tea cup, wool fabric and felt, basic sewing supplies like needles and thread, stuffing and glue. 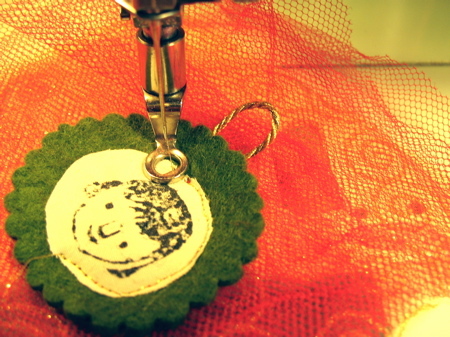 This project is suitable for anyone with basic hand sewing skills. This pattern is in Adobe pdf format. 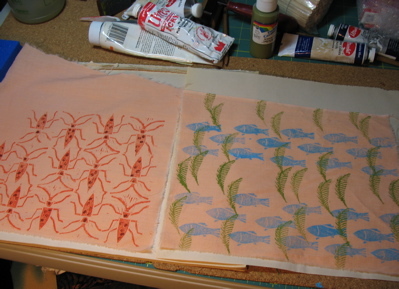 You will need Adobe Acrobat Reader to view and print this pattern–available free at adobe.com. Here is a link to my etsy shop. This quilt is made out of old wool shirts. I had 8 plaids in different color schemes. Red and green predominated. I love color and when I am doing non-figurative art, I tend to do color studies. The idea here is green to red to green again. I first used this way of designing a quilt 30 years ago when I made this one. (blues, dark to light and back again) When I posted about it last year, I couldn’t remember how I did it, but somehow it all trickled back since then. I am not an expert quilter. I have never progressed beyond squares or rectangles. This is a very easy and, I think, non-scary way to approach patchwork. Careful measuring, cutting and/or piecing is not required. This is one of those “wing it” projects. 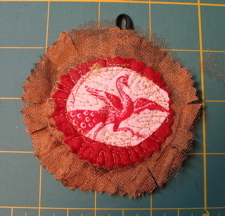 The photos are mostly underexposed so you can see the different fabrics, even though they are dark. 1. Make a template. Mine is 12 inches by 24 inches and made by taping 2 pieces of 12 x 18 inches of paper together. It can be any size but take into consideration what size fabric scraps you have and what size quilt you want to make. 2. I cut up my shirts, trying to get any piece of undamaged fabric that was at least 13 inches in one direction. 3. I piled them up by plaid and arranged them in order from most red to most green. and 8. when eight were done, laid them out on the floor and played with the arrangement. 9. I sewed the blocks together- first matching the red centers and then sewed the four strips together lengthwise. Iron everything. 10. Here is the top laid out on an old blanket that I used instead of batting. 11. Here is the back- I used the biggest pieces that I had and put them together with the least amount of sewing and thinking that I could manage. 12. And now, here are the three layers quilted together and ready for a binding. I hand-quilted the layers together because I never could have managed it on my sewing machine. The edge is basted together at this point. 13. I folded over that part over on the right side of the above photo to make the binding on one side… since it was so conveniently just the right size! 14. I cut bias strips from the last of the shirt backs that I had and used them to bind up the 3 other sides. And here is another photo of it finished! Let me know if I left out any important information or steps and I will edit this tutorial. I want to grow tomatoes this year. I want to have a LOT of tomatoes instead of a few very precious and expensive ones from the farmers market. Unfortunately I live in an old house with toxic soil around it- not unusual in New England urban and suburban areas. The soil has years of lead paint scrapings, car fumes (more lead) and who knows what. It is not soil anyone would want to grow edibles in. The solution is raised beds or containers. I am going to try to write a tutorial about how I planted my tomatoes based on the excellent suggestions of Bella Dia. I think I’ve mentioned before that I have a house full of stuff. That makes me reluctant to go out and buy more stuff- like containers to grow tomatoes in. Here is how I made my own, hopefully biodegradable, containers and got my tomatoes started. some garden fencing that was stuck up in the rafters of the garage, already starting on the biodegrading part- ie rusty. Step 1: Cut the label out of the shirt since it is probably not cotton and wouldn’t decompose. Step 2: Make a circle shape out of the wire fencing. Mine is about 16 inches across. Step 3: Place in the garden and push the wire prongs into the soil. Step 4: Put the t-shirt into the circle, collar edge down. Stretch the bottom edge of the shirt around the top of the fencing. I didn’t worry about weeds underneath- whatever was there will be dead soon. Now there is a “pot”! Step 5: Fill it half way with compost or other clean filler dirt, like all last years window boxes that you are replanting. I used compost from my compost pile. Push and stretch out the sides of the t-shirt as you add dirt. Step 6: Center the tomato plant on top of the compost. Loosen up the root ball. Step 7: Use the commercial potting soil to fill in around the plant and up to an inch or so from the top. Yes, you are burying 6 inches of stem and leaves. Trust me, that is a good thing. Water thoroughly. Step 8: Wait 2 months. Hopefully, tomatoes! I’ve got 4 done. One more to go. 1. Here is the basic pattern. 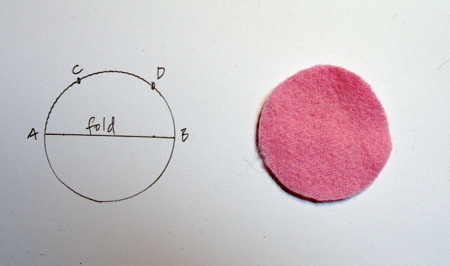 Circle, Fold in half, point A goes to point D, point B goes to point C. Stitch in place. 2. 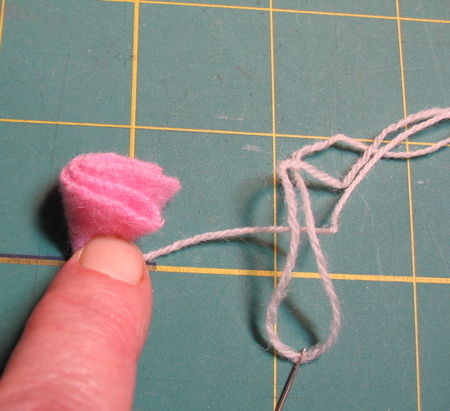 Start out by making a knot at the end of your thread. 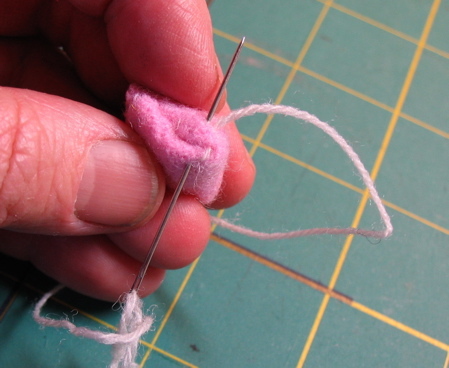 Pull the needle and thread through the center point of the fabric towards the back. 3. 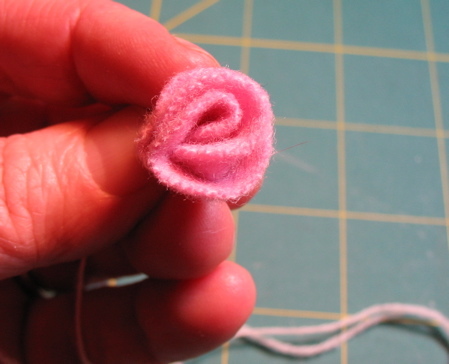 Fold the circle in half, covering up your knot. 7. 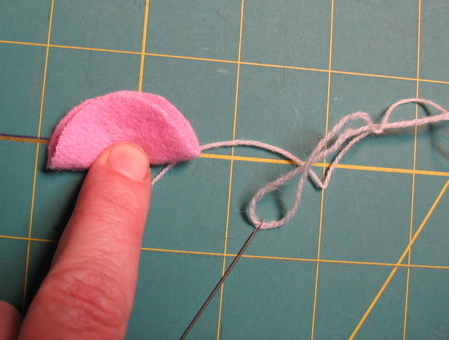 Stitch back into the fabric at the tip of the outer point. 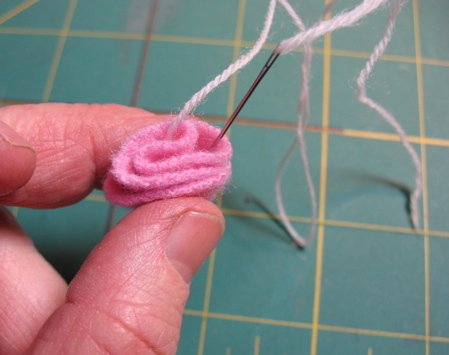 Slide your needle and thread back down to the bottom- you’ve done one stitch. 8. 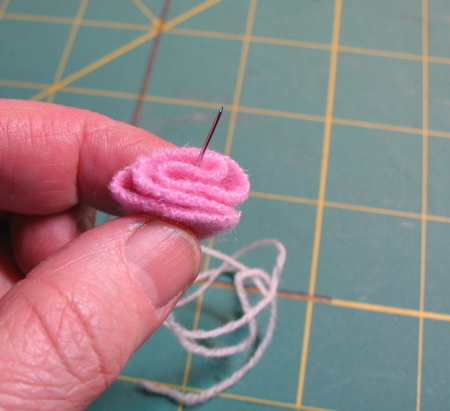 Now slide your needle up into the center of your rose. 9. 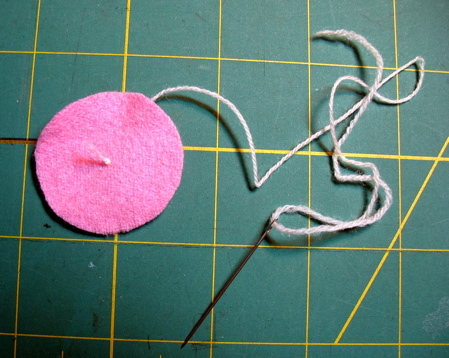 Bring your thread around and stitch back down into the center. This will catch the inner fold and pull it down into the center. 11. Take a stitch or two in the bottom to anchor everything. 12. 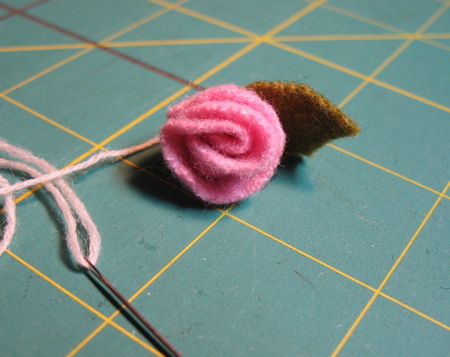 You can add a leaf or two and then sew it where ever it needs to be! 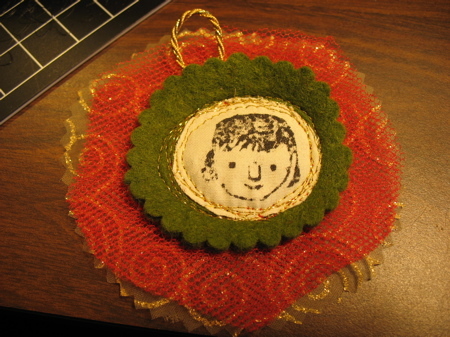 I needed to make an ornament for a holiday swap. This was quick and easy and you could use the same basic idea to make tags, valentines, bookmarks… I don’t know- tons of other stuff! -nylon net, tulle and/or any sheer or glittery fabric. 1. 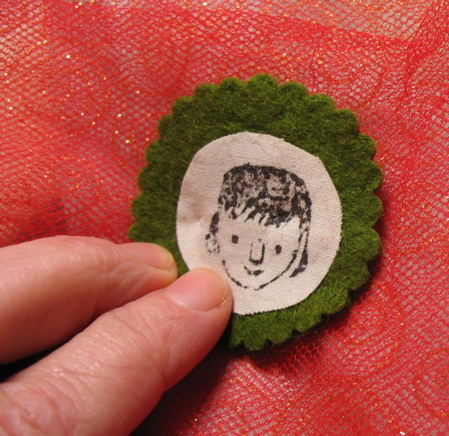 Collect fabrics that have images you’d like to use- faces, birds, flowers, whatever. 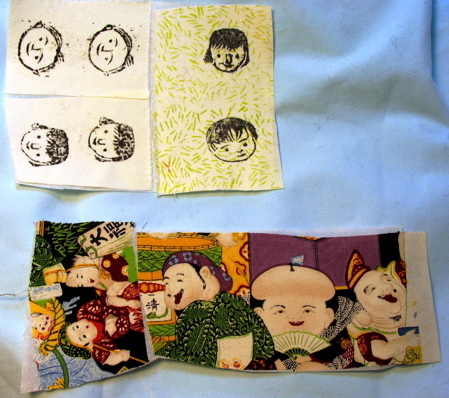 I used some commercially printed fabric with an asian design and also some of the fabric I made last summer with carved stamps. 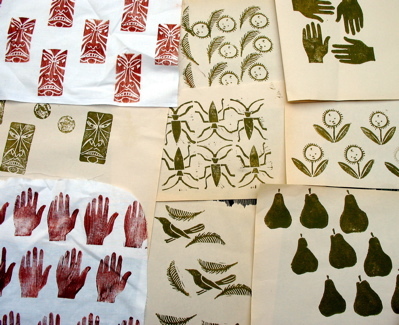 You could use commercially available rubber stamps to stamp fabric. 2. Iron iron-on adhesive onto to the back of your images. 3. Trim your images to shape. 5. 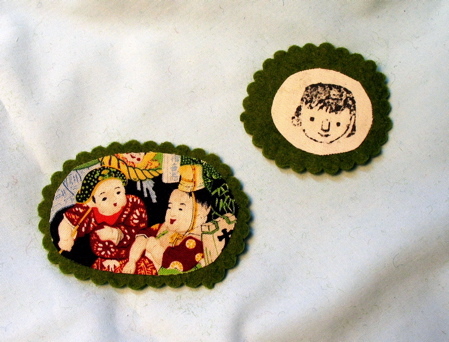 Cut out the felt, making a frame around the image. Use all those decorative scissors you own but never get around to using. I used pinking shears and scallop shears. 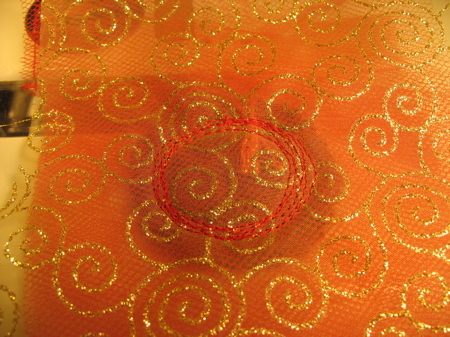 7.Fold up the net so that there are 6 – 8 layers of the net. 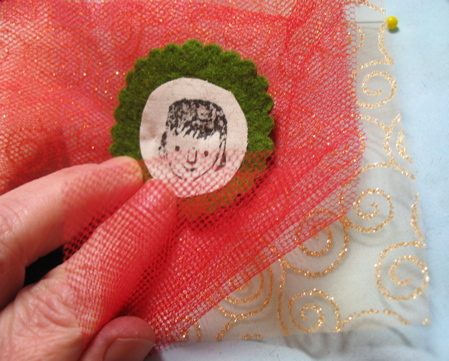 Make a pile with your little image on top, the layers of net in the middle, and then some other decorative fabric on the bottom (optional). Pin everything together. Fold your hanging cord/ribbon in half and place at the top of the ornament. 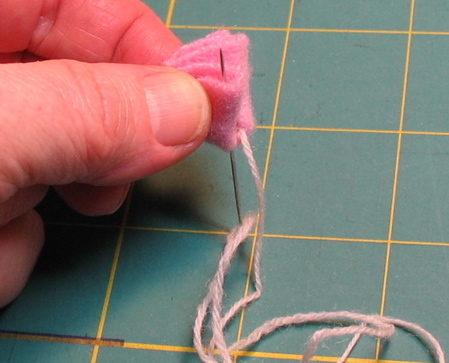 Make sure you put it far enough down so that your stitches will catch it. 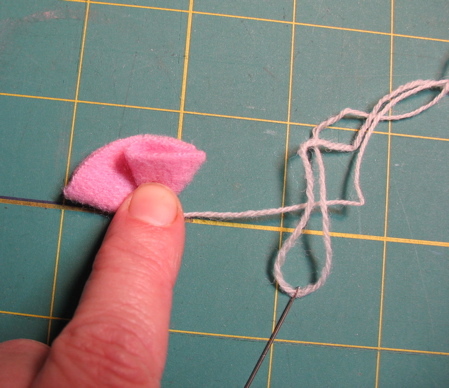 Start sewing by going back and forth a few times over the hanger. 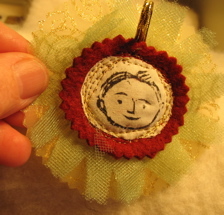 … this photo does not show that though, because I forgot to put the hanger in EVERY TIME I made one!!! Mostly I remember to stick it in before it was too late, bit if you don’t, no problem. You can see that some of mine have a cord strung in the top of the ornament afterward. Easy! 9. 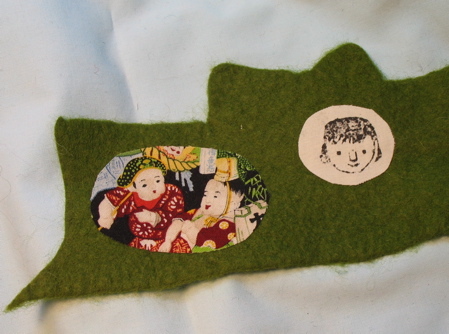 Now sew around the edge of the image. Since I did mine with free motion embroidery, I went around the edge enough times so that the gold thread showed up and everything was well stitched down. 11. 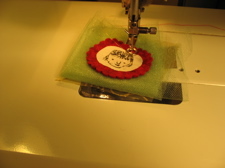 When you are finished with the stitching, clip the threads. 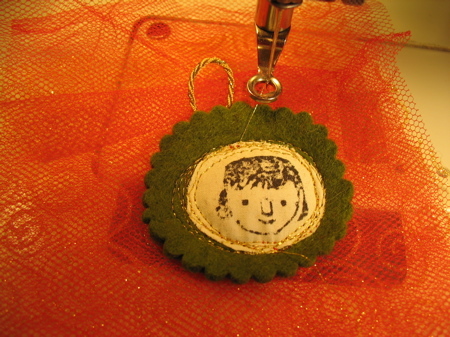 Trim the net into a nice circle around the edge of your ornament. You can cut the net separately from the bottom fabric. I’d love any feedback on this. Are the written directions and the photos clear enough? Have I left anything out? I can never quite figure out the fine line between too little information and too much. Have fun! I have needle issues.Â I am picky about what I use- some I like to use for wool embroidery, different ones when I am using cotton floss.Â I always seems to be dropping or misplacing them and then can’t find them again.Â I get so distracted if I have to go looking for more needles or threading and unthreading them constantly.Â In the middle of working on one of the babies this morning, I’d had it.Â I needed a better system. My idea was to have a strip pincushion.Â I could stick all the right type of needles into it at the beginning of a project.Â I could pre-thread several so I wouldn’t be starting and stopping the flow.Â I’d have a place to store my needles that were threaded with a color I was finished with, until next time I needed it. 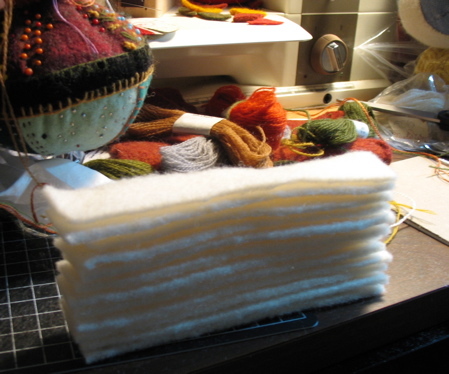 A while ago, I bought a piece of 100% wool felt at Joanns fabric, but it is really too soft and I hadn’t figured out how to use it for anything.Â I cut a strip, 18″ long and 2 inches wide.Â I cut that into pieces 6 inches x 1 inch and piled them up. phew!Â Success! 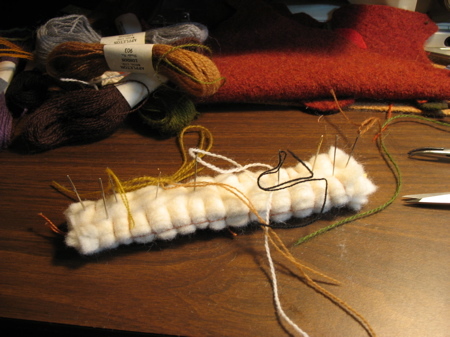 Â It is about 3/4 of an inch thick.Â You could make this out of any scrap wool and I think scrap pieces of felted sweaters would be perfect.Â This way of storing the needles has an added benefit-Â the needles won’t get lost into it like they often do in standard pin cushions.Â Now back to work! This baby is finished now, but it is wet and rainy outside today, so I will take more photos tomorrow. I mentioned at the end of the last post that I was starting to work on my pieces for the printed fabric swap over at Bitter Betty Blogs. I signed up because I have been wanting to try it forever and this is the push I need. printing. I REALLY didn’t want to go out and buy printing inks- I know, I’m cheap. But I have so many types of color mediums already- I just couldn’t imagine bringing something new into the house. I was thinking about oil paints, oil bars, acrylic paints, to start the list. I found this article and it helped me settle on acrylic paints. This is another page of useful links and information. I wanted something that would be washable and have a good feel, not stiff- I want to be able to actually use this fabric! 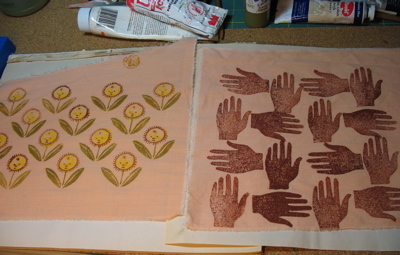 The brown stamp on white was my first attempt on fabric. Based on the various bits of information I could find, this is what I have figured out so far. -Acrylic paints work very well, but don’t try using a brayer or a brush of any kind- I couldn’t manage anything that wasn’t very streaky. Daubing the paint onto the stamp works very well- I used the make-up sponges and also some wads of felt. -adding drying retardant was helpful both in slowing the drying and also making the paint a bit gummier. -one article suggested dampening the fabric first. I had no better results when I tried that. Actually I had some color bleeding so I’d say forget that idea. 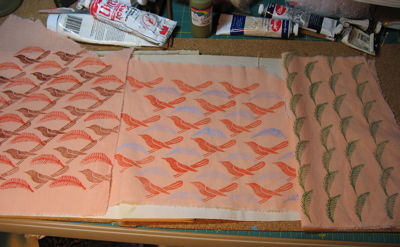 -after I finished printing/stamping, I let the fabric dry for a bit (1/2 hour?). 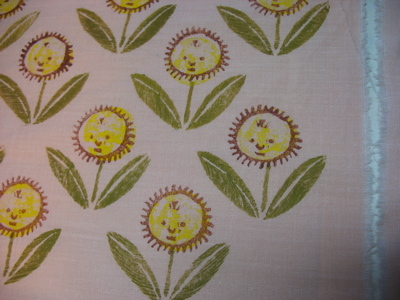 Then I ironed the fabric on both sides with steam on a cotton setting. I have no idea if this was necessary. I then threw them all into the washer at a regular warm wash. I noticed no change in the color at all, after the wash. Yeah! 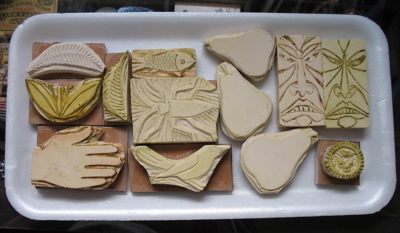 Now I have to think about doing my bigger pieces- yikes! This is actually a lot harder then I ever thought. I am nervous about the 1/2 yard pieces with no major screw-ups. Also, choosing the colors turns out to be a lot harder then I thought it would be. I will be coming out of this project with a new respect for fabric designers! 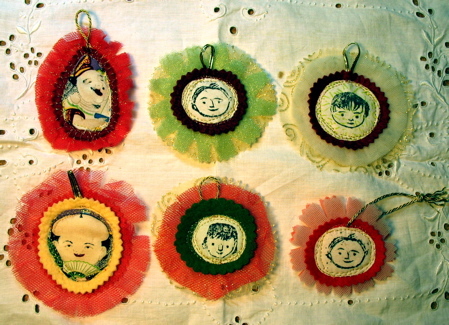 They are made from photos of Mosaics on Flickr. First, I made up a variety of mosaics. I picked out photos that worked well in the square format and in a 2″ x 2″ photo. I made the mosaics 2 photos by 3 photos since that translates perfectly to a 4 x 6 photo. The most important thing is to upload your images in the large size- spoken from experience. My first batch of photos was too grainy to use. I printed out my info- name and etsy site address- nothing fancy. 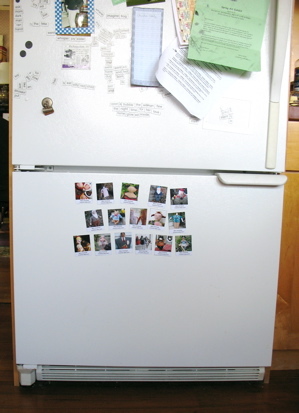 Then it was just putting them together onto the self adhesive magnetic sheet. 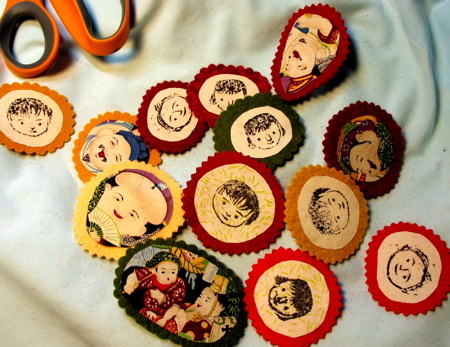 The paper doll project brought this stuff into my life and I’m loving it! 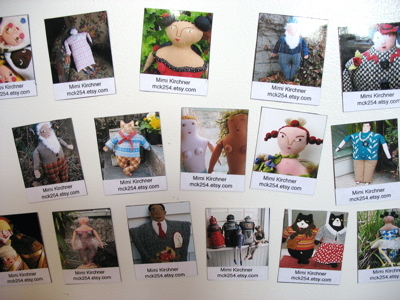 This project involved no special tools- the photos were printed at Target, I got the magnetic sheets at AC Moore, you can cut the magnetic sheeting with regular scissors, I printed out my info on regular paper with my very low end printer. Yes- meets all criteria!